As I mentioned previously, this is a very simple process, but you have to make sure you are careful and review your choices. 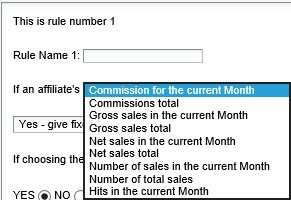 The first half of the page is where you want to name the rule (so you can identify it), what the threshold is (amount of commissions in a month, sales or clicks), whether it will be a flat dollar amount of a percentage, recurring bonus or one-time, what affiliates are to be included. This is what makes this tool great, you can include or exclude whoever you want. If you do not want to include coupon affiliates in the bonus, simply do not add them. A quick tip: if paying bonuses by group or types of affiliates make sure you have groups set up so you do not have to go in and manually remove/add affiliates. Continuing down the page and finishing up the set up process, next choose the date you wish to start (and end) the campaign. This is important because the bonuses will only be paid within the period you select and it cannot go back in time and credit affiliates. If you do wish to go back and credit affiliates you can “Post a Manual Transaction”, but that is a topic for a different day. You can restrict affiliates based on their join date (when they were approved in the program) or you can simply select their affiliate ID from the box and they will be excluded. There are multiple ways to customize this tool to ensure you have the best bonus campaign available with who you want to participate. Once all the fields are complete, hit the “Set Commission Rules” box and it will be saved and activated on the date you input as the start date. 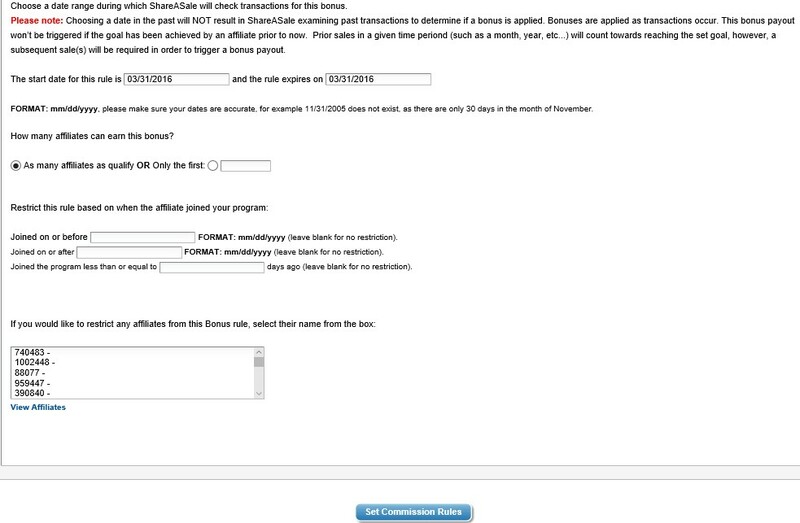 Activating affiliates in your affiliate program is a must (new or existing program). With ShareASale’ s “Bonus Promotional Campaigns” tool it allows you to fully customize an activation campaign based on the metrics you choose, and they best part of it is that ShareASale handles everything. With all the time you will save you now can focus on recruiting new affiliates and growing the program to new levels.